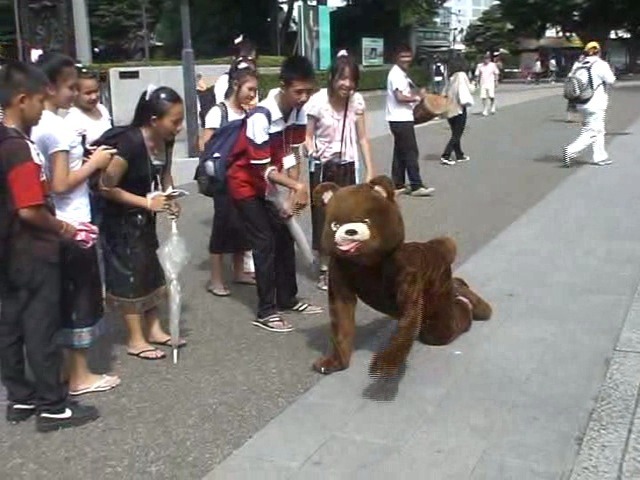 From Ueno station to Ueno zoo, Niwa, dressed as a bear and walking on all fours, goes to meet a real bear. Although it is obvious that he is in a costume, people passing by on the way offer cheers of support. Niwa was not able to enter the zoo, however, by performing this seemingly senseless action through an animal, the artist was able to achieve gaining reactions that are normally unimaginable in the real human society. And from those reactions, this work questions the form of our relations with the people around us.